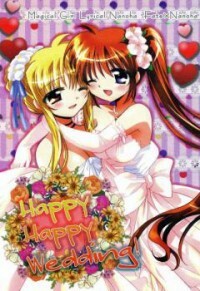 From NanoFate: In this 40 pages long doujin Nanoha and Fate take a visit to a church, and decide to rent dresses to pose as wife and wife. This is a story full of fluff, romance and cuteness, with a very fitting art style. The sugar level in your blood may go over the top after reading this doujin, so proceed with caution.